Iranian President Hassan Rohani is seeking to quiet the misgivings of millions of Americans about crowds of Iranians that parade around Tehran chanting "Death to America!" 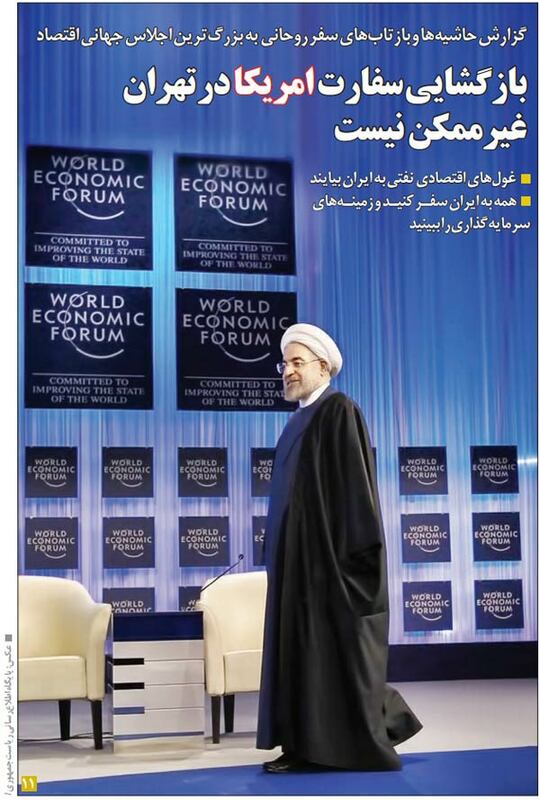 Iranian President Hassan Rouhani at the World Economic Forum in Davos, Switzerland in January 2014. Rouhani said at the forum that reopening of the US Embassy in Tehran isn't impossible. In an interview with the CBS show 60 Minutes to be broadcast on September 20 in the United States, Rohani said the famous chanting ritual on Fridays after Muslim religious services is not a swipe at the American public but rather a reaction to historic Washington policy decisions that hurt Iran. The wary reaction that many Americans have to the chanting is one of the factors that fed opposition to the Iran nuclear deal that Rohani's government negotiated with President Barack Obama's administration and other world powers. The deal survived congressional review this week thanks to parliamentary rules that allowed minority Democrats to block a disapproval resolution backed unanimously by the Republican majority in Congress. Republican opponents of the deal, including all the GOP presidential candidates, often cited the "Death to America" chanting as proof that Iran, which is ultimately ruled not by Rohani but by the fiery anti-American Supreme Leader Ayatollah Ali Khamenei, remains a resolute enemy of the United States. But Rohani, who is seen as a moderate reformer in the Islamic republic, told CBS interviewer Steve Kroft: "This slogan that is chanted is not a slogan against the American people. Our people respect the American people." "The Iranian people are not looking for war with any country," Rohani said in extracts from the interview released on September 18. "But at the same time the policies of the United States have been against the national interests of Iranian people. It's understandable that people will demonstrate sensitivity to this issue," Rohani said. "When the people rose up against the shah, the United States aggressively supported the shah until the last moments. In the eight-year war with Iraq, the Americans supported [former Iraqi dictator Saddam Hussein]," he pointed out. "People will not forget these things. We cannot forget the past, but at the same time our gaze must be towards the future," he said. Recent history featured many episodes that poisoned relations between Iran and the United States. Iran rose up against its pro-U.S. monarch, Shah Mohammed Reza Pahlavi, in 1979. After the revolt, radical Iranian students took 52 U.S. Embassy workers hostage and held them for more than a year. During the Iran-Iraq War between 1980 and 1988, the United States backed Hussein despite the deaths of up to a million Iranians, many through chemical-weapon attacks. Only after Hussein attacked Kuwait in 1990 did the United States seek to curb his power, and it was more than a decade later that U.S.-led forces drove Hussein's regime out of power out of concern about his use of weapons of mass destruction. In other interview highlights, Rohani predicted that the nuclear deal would survive a "bitter debate" in Tehran between moderate supporters like himself and hard-line opponents, much like the contentious debate in Washington. Rohani said it's "hard to say" how Iranian-American relations will proceed as the deal is carried out in coming months. But he expressed hope that various economic openings such as the resumption of tourism and trade will help to bolster goodwill and a further thaw in relations between the longtime adversaries.